New York Cheesecake is one of my favorite desserts. Cheesecake Squares are just a modified version of this cheesecake, combining the grainy texture of a graham cracker crust with a thin layer of cream cheese filling. This recipe makes a 9 x 13 inch (23 x 33 cm) pan which is perfect for large gatherings. Lovely served with fresh berries or fruit sauces. These Cheesecake Squares begin with a Graham Cracker Crust. Graham Crackers are a flat, rectangular-shaped, slightly sweet whole wheat cookie (cracker) that are named after their creator, Rev. Sylvester Graham (1794 - 1851), who was a United States dietary reformer. When crushed and mixed with a little sugar and melted butter, graham crackers make a very nice pastry crust, especially when paired with a creamy filling. There are two ways to set the crust. One is to simply chill it in the refrigerator, the other way is to bake it (used here) just until set. When making this crust, always press the crumbs evenly and firmly into your pan and while the crust may seem loose, it will harden after it bakes and cools. The main component in a cheesecake filling is cream cheese, which is a white, soft and spreadable cheese with a slightly tangy flavor. It has a 33% butterfat content so its texture is wonderfully smooth and creamy. To ensure a smooth texture, free of lumps, always bring the cream cheese to room temperature before beating. After adding the other ingredients the filling is poured over the crust and baked just until it sets. Chill the squares before cutting into individual slices. Make sure to use a sharp knife and have a damp cloth nearby so you can wipe off the knife between cuts. These squares are excellent plain or with fresh berries. You could also serve them with chocolate, blueberry, raspberry or strawberry sauce. Note: If you live in a country where graham crackers are unavailable, use crushed Digestive Biscuits or even crushed butter cookies. 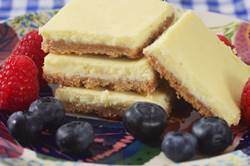 Cheesecake Squares: Preheat oven to 325 degrees F (160 degrees C) and place the rack in the center of the oven. Have ready a 9 x 13 x 2 inch (23 x 33 x 5 cm) baking pan that has been lined with aluminum foil across the bottom and up two opposite sides of the pan. Lightly butter or spray the foil with a non stick cooking spray. Cheesecake Filling: In the bowl of your electric mixer, or with a hand mixer, beat the cream cheese until smooth. Add the sugar, lemon juice, lemon zest, and vanilla extract and beat until smooth. Add the eggs, one at a time, beating until incorporated. Scrape down the sides of the bowl, as needed. Pour the cheesecake filling over the graham cracker base and bake for about 18 - 20 minutes or until the cheesecake batter is just set. Remove from oven and place on a wire rack to cool. Cover and place in the refrigerator for several hours to make the squares easier to cut. To cut into squares - place on a cutting board, remove the foil, and with a sharp knife, cut into 2 inch squares. Have a damp cloth on hand to wipe the knife between cuts. Garnish with fresh berries, if desired. Store leftovers in the refrigerator.